Dr. Montgomery has practiced in the Twin Cities for many years at his Woodbury, MN office, during which time he has acquired a vast amount of experience in restorative and cosmetic dentistry. 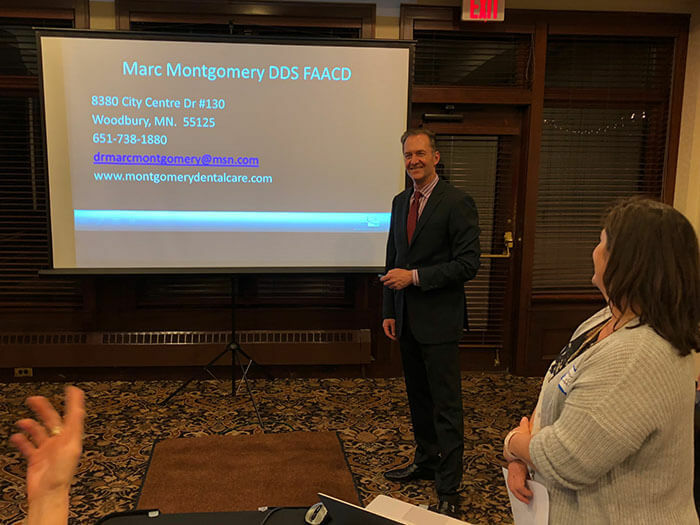 The Minnesota Academy of Cosmetic Dentistry (MACD) held an event on November 2, 2017, held at the North Oaks Golf Club in North Oaks, Minnesota, United States. The presenter was Dr. Marc Montgomery FAACD, DDS of Woodbury, MN and spoke on the topic of Streamlining Esthetic Dentistry. Attendees of this event gained insights from his experiences beginning with when a patient first inquiries about a cosmetic treatment, through the stages of treatment, and culminating with how to successfully complete a dental restoration with a summary case study. As a noted author of several published clinical articles in numerous International dental journals, some of his favorite topics are Predictably in Meeting Patient’s Expectations in Esthetic Dentistry and How Full Mouth Rehabilitation can be Simple and Affordable. AACD attendees are rewarded with new skills, cosmetic dentistry techniques, and confidence that they can offer world-class dentistry. Dr. Montgomery teaches intensive hands-on workshops where the low attendee to instructor ratio means that meaningful discussions ensue. An increasing number of individuals are seeking cosmetic dental services because of the recognized benefits of these treatments especially in improving a person’s sense of self-worth and self-confidence. While many regard cosmetic dentistry as core to the maintenance of optimum oral and dental health, more dentists are investing in the latest techniques to meet higher patient interest in these procedures. Dr. Montgomery focuses on providing cosmetic-oriented family dentistry for all ages. He is an Accredited Fellow member of the American Academy of Cosmetic Dentistry (AACD) and only one of 80 Accredited Fellows in the world (one of only 3 in Minnesota). Dr. Montgomery has received 17 awards with AACD Smile Gallery Competition. He teaches viable treatment options for contemporary restorative, cosmetic, and surgical dental practices. He has been involved in several dental extracurricular activities including: past President and 12-year board member of the Minnesota Academy of Cosmetic Dentistry; past board member of the AACD ethics committee; volunteers with the AACD Give Back a Smile Program; lecturing for several local dental organizations, and published several case studies. This year Dr. Montgomery was voted a Minneapolis and St. Paul Magazine Top Cosmetic Dentist for the ninth consecutive time. “I’m honored to be included in this group of highly respected colleagues,” says Dr. Montgomery. Other years of awarded recognition as Top Dentist are 2000, 2002, 2005, 2007, 2009, 2011, 2013 and 2015. Dr. Marc Montgomery MACD Speaker: Stay in touch with future MACD events to have a chance to hear him speak in the future.